Bead curtains are like, so 1950's huh? Artist Devorah Sperber doesn't think so. Her amazing Star Trek bead curtains are much more likely to be adorning gallery walls than the front door of your local grocery store. 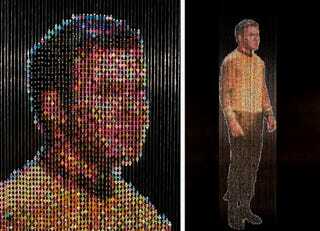 Kind of like pixel-art in 3D, she slides tens of thousands of beads onto threads to create these detailed portraits. Check out the holodeck door, Enterprise-D's bridge, and my favorite: the "beaming down" series, which looks spookily like the "real" special effect.